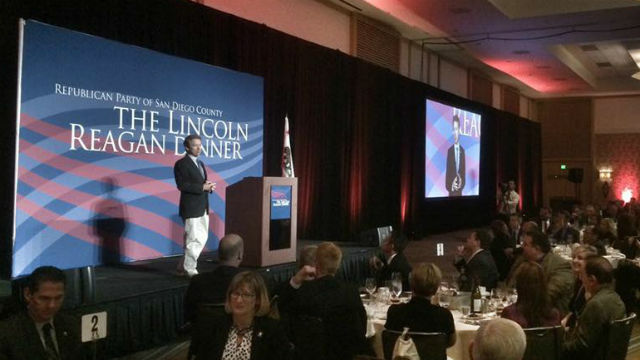 “I want national defense to be the priority in our country, but it doesn’t mean reckless intervention and it doesn’t mean war is always the answer, it means war is the last resort,” Paul told KUSI-TV in an interview before speaking at the Republican Party of San Diego‘s annual Lincoln Reagan Dinner Saturday at the Hilton San Diego Bayfront. “Right now, the Iraqis don’t seem to want it enough,” Paul told KUSI. “They don’t seem to be willing to fight. Until they’re willing to fight and until the Iraqi army becomes a national army, with Sunnis and Shiites in it, it’s going to be difficult. Paul told KUSI the Obama administration’s 2013 decision to join Saudi Arabia and Qatar in providing arms to moderate rebels in the Syrian Civil War allowed the Islamic State group to grow larger because “some of these weapons found their way to ISIS,” using an alternative name for the Islamic State group. In a news conference before the speech which made him the first announced 2016 presidential candidate to speak in San Diego, Paul said “securing the borders are the most important thing you do,” regarding controlling illegal immigration.